Since graduating from the University of Idaho Law School in 1983, Brian Elkins has established himself as a statewide authority on the intricacies of DUI law. 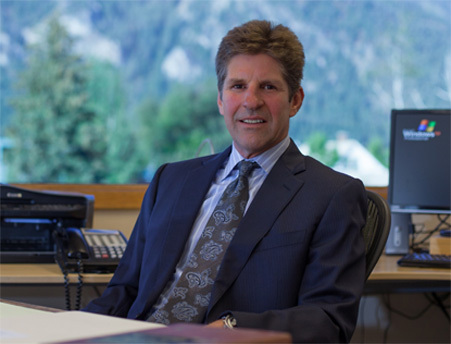 Brian has been practicing law in the Hailey/Ketchum/Sun Valley, Idaho area since 1985. When he first came to Blaine County after graduating from law school, he law clerked for the Honorable Doug Kramer at the Blaine County District Court. During his first three years practicing law, he was a named partner in a firm based in Hailey. Because of his interest in the constitution, Mr. Elkins began to focus on criminal defense. Early in his practice, he developed an extensive knowledge of defending those charged with crimes and the crime of driving while under the influence. This knowledge, combined with his background in sciences used in criminal cases, gives Mr. Elkins a unique perspective in defending these types of cases. Because of this, Mr. Elkins was certified by the Idaho Trial Lawyers Association as a Criminal Trial Specialist in 1997. Mr. Elkins has handled cases from juvenile court and traffic tickets to first-degree murder, and he has taken cases to the Idaho and US Supreme Courts. He believes there are certain fundamental themes to a successful criminal defense: a vigorous and thorough understanding of the facts and law and a precise view of the issues presented. His experience has given him local knowledge and a keen understanding of the legal system in Blaine County. As one client recently observed: "Brian was very professional and efficient, and at the same time thoughtful and sensitive to what I was going through. He was thorough in his investigations and he explained what was going on throughout the entire process. He made me feel comfortable in court and was helpful in every way possible. I would go back to Brian if I need a lawyer in this field again (which I won't! ), and I have recommended him to friends." Another client offered: "Mr. Elkins proved to me that he is an intelligent, quietly aggressive, and caring attorney. His staff was incredible. He always took my calls, and if he was busy, he contacted me immediately after receiving my message, even while he was on vacation. He listened to my grief and always answered my questions and concerns. We went through nine months of hell preparing for my 3 day jury trial...we won." Mr. Elkins is a frequent lecturer on criminal defense and writes extensively. After defending a first degree murder case that was ultimately reversed by the Idaho Supreme Court, he wrote a law review article entitled, Idaho's Repeal of the Insanity Defense: What Are We Trying to Prove? His work has also received acclaim from various peer groups. Most notably, Mr. Elkins has an AV (highest possible rating in both legal ability and ethical standards) from Martindale-Hubbell; he is also listed in Best Lawyers in America and Mountain States Super Lawyers. A native of Priest Lake, Idaho, Mr. Elkins attended undergraduate and law school at the University of Idaho. Between his second and third year at law school, he was hired as a legal intern for the Blaine County Prosecutor in Hailey and began his legal career in the Sun Valley area where he returned after graduating from law school. After working as a law clerk, in 1985 he served as a Deputy Prosecuting Attorney for Blaine County before working as a Public Defender. He has been a sole practitioner since 1988.